After a long day of work, you deserve to head to your Garland, Texas, home and retreat to a peaceful bathroom where you can relax in a soaking tub or step into a modern shower that can wash away the day’s stresses. If your bathroom doesn’t feel quite like the relaxing environment you wish it was, allow the skilled professionals at Star Home Remodeling to complete the bathroom remodel of your dreams. We have been part of the home remodeling industry since 2007 and have earned a number of accolades throughout the years, including multiple Best of Houzz awards. When you turn to us for your bathroom renovation, you can feel confident knowing that we can take care of all aspects of your remodel. During the design process, we will take the time to speak with you in detail about all of the products and services we offer so that you can make the best decisions and stay within your budget. As a no-nonsense business, we will always be upfront and transparent with you about all aspects of your project, including cost estimates. 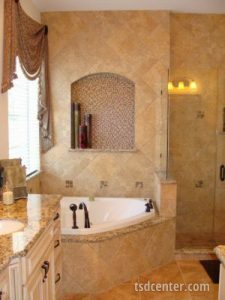 In addition to creating a stunning design for your new bathroom, we can provide you with the products you’ve chosen to incorporate into the space, obtain all required permits for the renovation, handle the construction, and install all of the new features you’ve picked out. For more information about the bathroom remodel we can complete at your North Garland home, contact Star Home Remodeling today. We’ll happily answer any questions you have and schedule you for a consultation where we can learn all about how we can transform your bathroom into a relaxing space you can enjoy every day.